Man, this was weird. Like, I almost couldn’t follow it at all. Nothing that happened followed much logic. It’s like a more adult The Goonies. I guess that’s just the ‘80s for you. I loved the practical effects and John Carpenter’s a great director, of course. It was fun at some points, but just kinda nonsense at others. I can’t say I really got into it. I wish it didn't occasionally engage in the kind of heavy-handed fantasy tropes it so often parodies. Despite this set back, Big Trouble is a ton of fun and Kurt Russell as the lovable idiot at the center is perfect for such a weird mashup of western and kung-fu tropes. 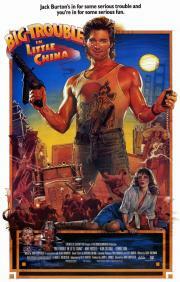 A few slick effects and Kurt Russell's bumbling deconstruction of the 80's action hero (with a healthy sprinkling of John Wayne) are the only things that redeem this cornball, cardboard mesh of Chinese mythology and 80s adventure cliches.